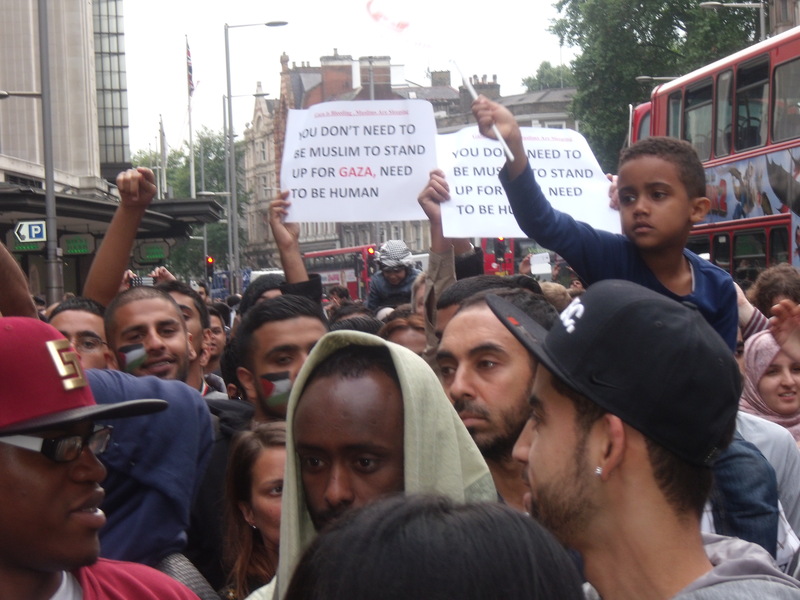 Protesters compare “Palestine” to Auschwitz and Dachau outside Israeli Embassy. 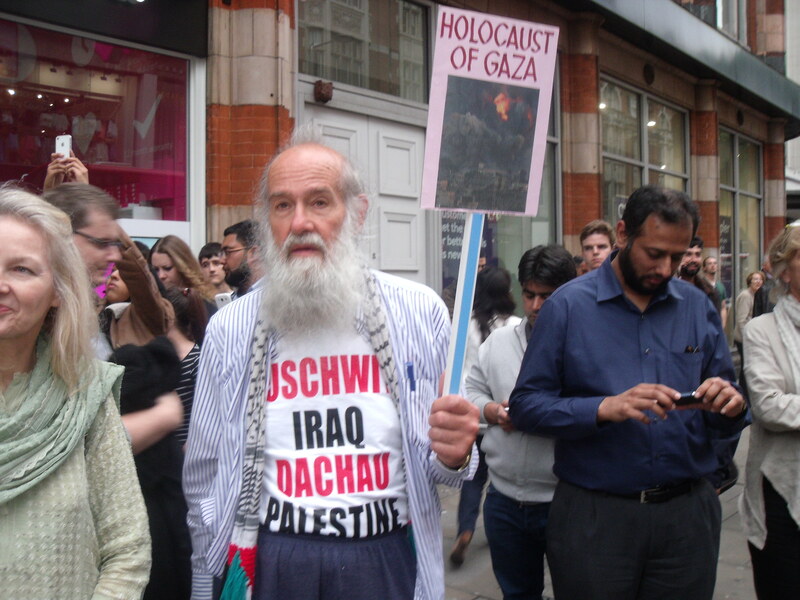 Yes, that really does say Auschwitz, Iraq, Dachau, Palestine. 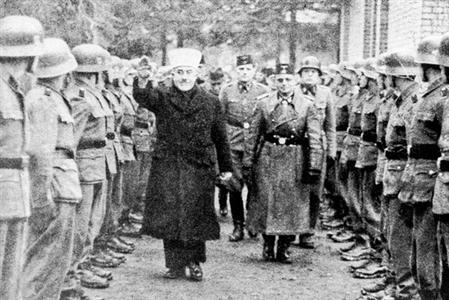 Some mocked the Holocaust, others disfigured the Israeli flag, a few screamed “Allahu Akbar”, they all called for the destruction of the Jewish state. 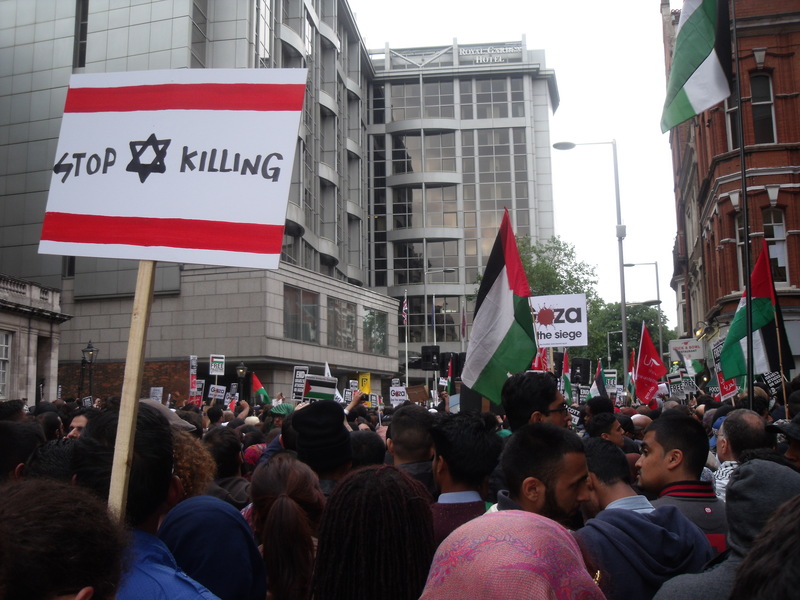 That was the scene outside London’s Israeli Embassy yesterday afternoon as many thousands thronged to hear blood-curdling speeches calling for the end of Israel. 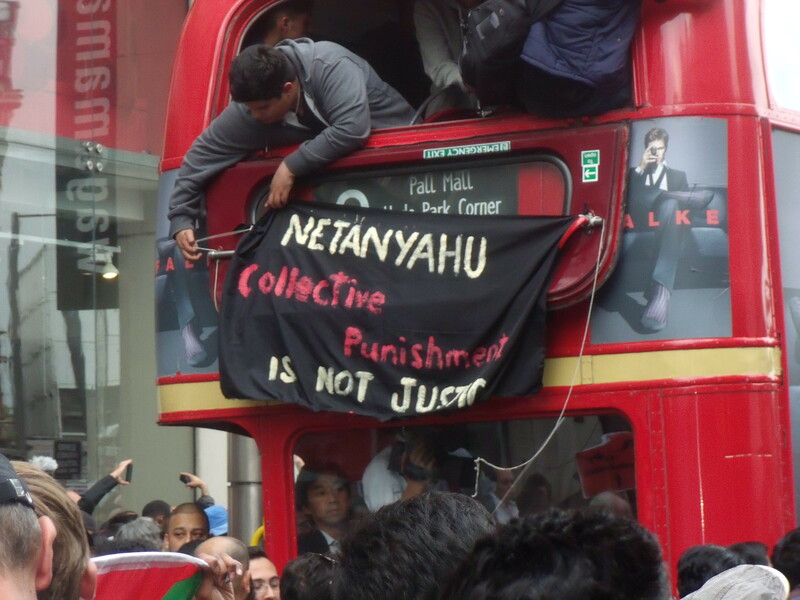 Kensington High Street was closed off to traffic leaving London buses stranded by the protesters who requisitioned them and covered them with anti-Israel slogans. 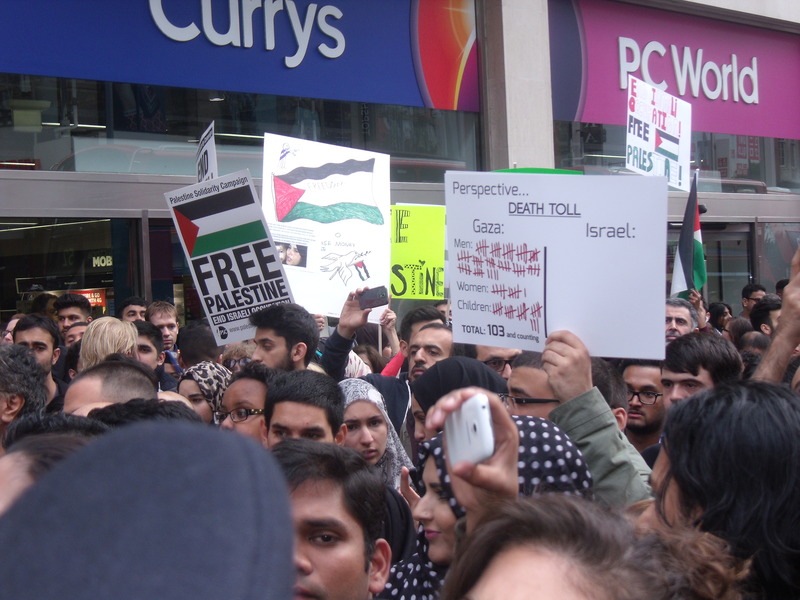 The protest against Israel’s latest attack on Hamas in Gaza was a toxic mix of Islamists, trade unions like Unison, charities like War On Want, the Palestine Solidarity Campaign and, of course, the extreme religious Jewish sect Neturei Karta. 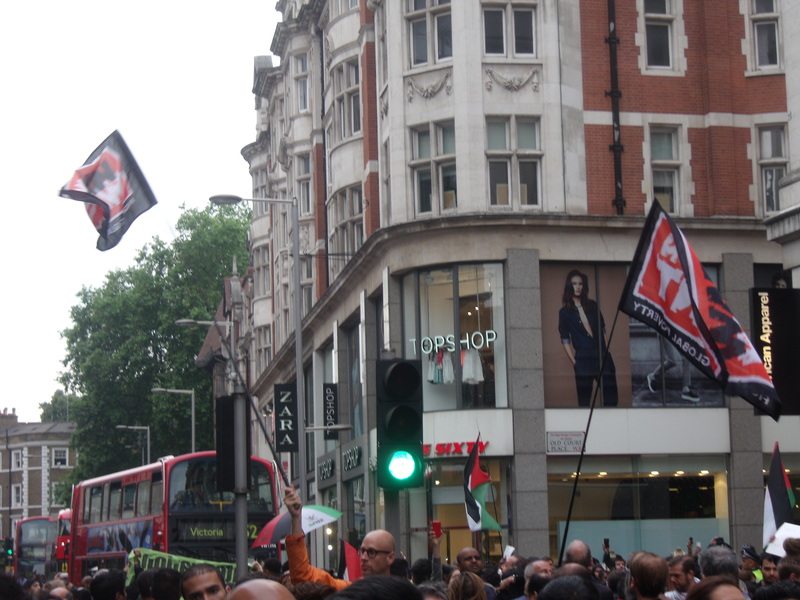 I knew I had outstayed my welcome when a protester grabbed me and shouted “A Zionist!”. I shook him off and made for the relative safety of the tube station. 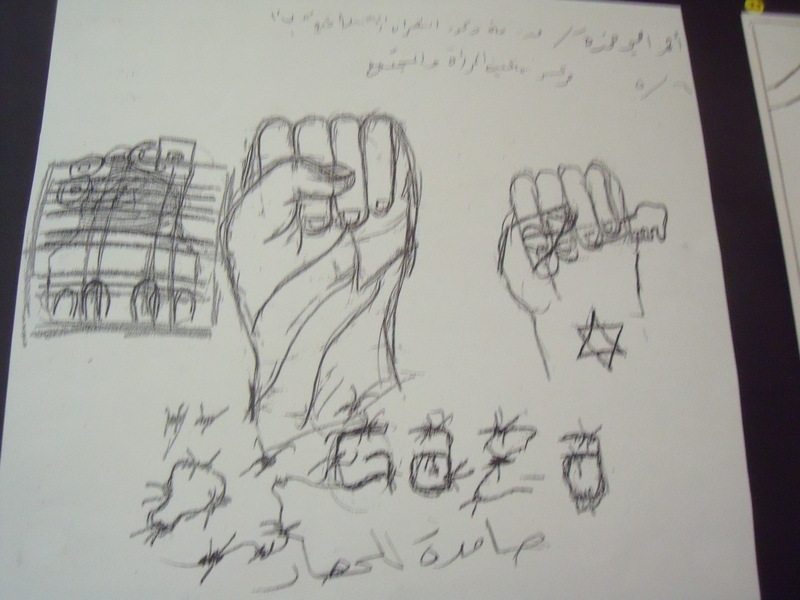 Disfiguring Israel’s flag. At least they didn’t burn it. “Cheap Jewish settlements” because Jews are tight money grabbers of course! 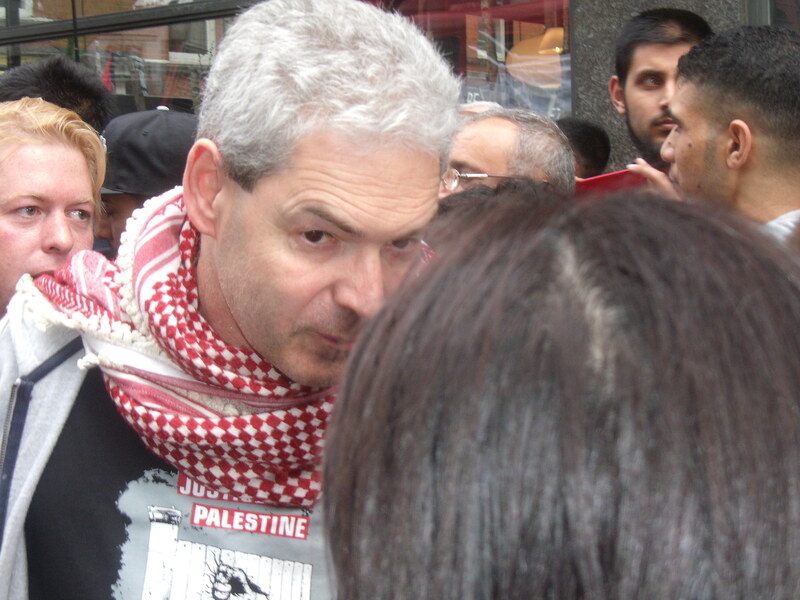 War On Want’s Executive Director John Hilary. Agreed! Palestinians should be freed from their Hamas oppressors. Is that because Israel builds bomb shelters but Hamas doesn’t bother, possibly? 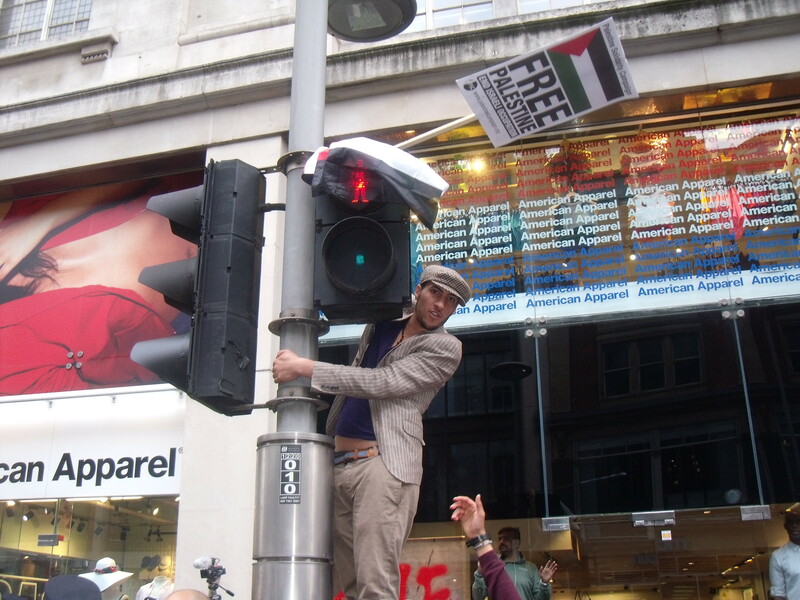 Courageous guy climbs a traffic light. They’re the stars of the show at these hate events. Will she be off to protest against Assad, Iran, ISIS and Boko Haram now? Police under pressure and looking under-numbered for once. Libyan support despite things not looking too rosy in Libya either. 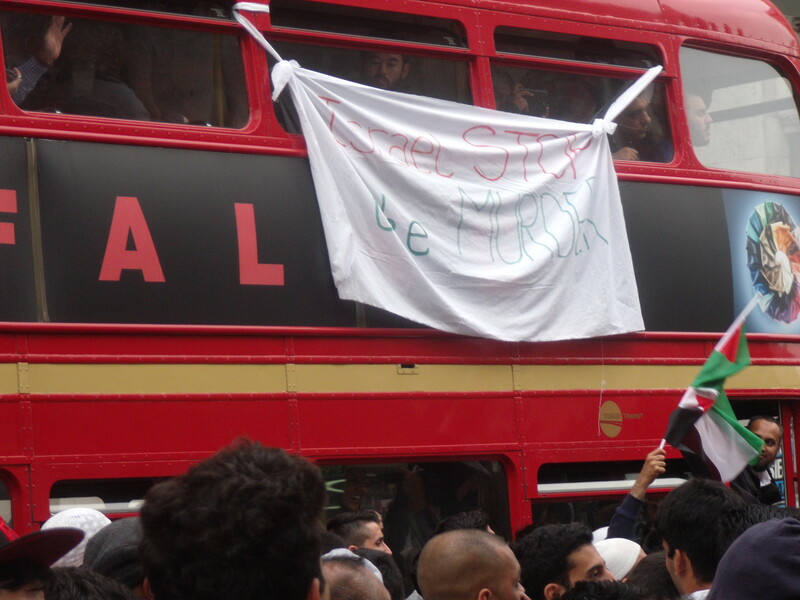 One of our buses gets occupied. Tell Boris! Remind me to invite him over for Friday night dinner soon. War On Want flags. WOW to be renamed War On Israel anyone? Not too sure what to say about this, so I think I’ll leave it at that. Can we have our bus back now please? Errr, the problem is not Gaza, the problem is Hamas. 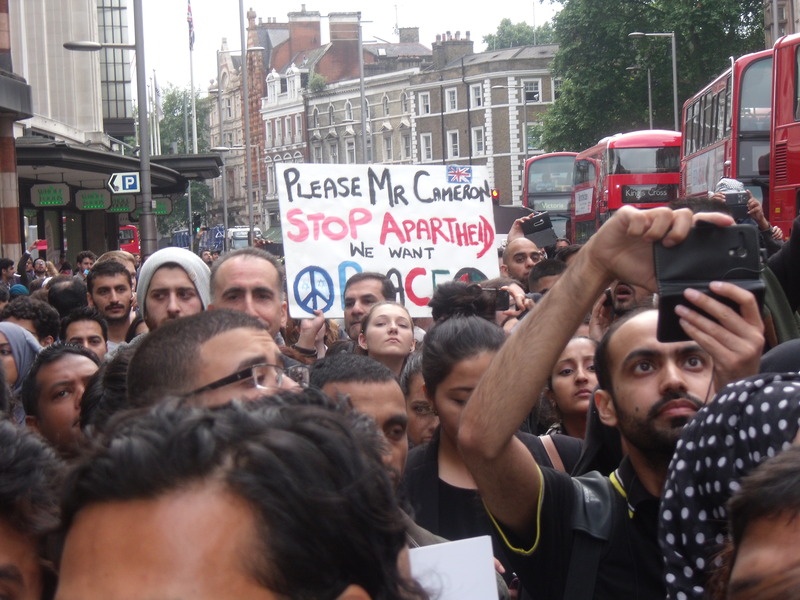 Ask them to ring back, you’re at an anti-Israel protest! War On Want No! Who can argue with that? Oh really. Now where does it say such a silly thing like that? “Cover up, sweety, it’s getting a bit chilly”. Aw. 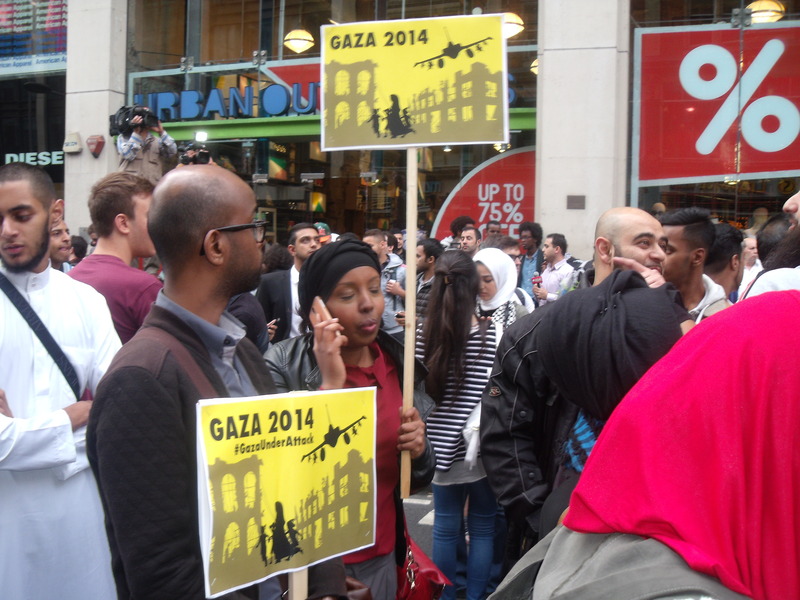 Labour MP Yasmin Qureshi apologises for comparing Gaza to the Holocaust. Well done, Tal Ofer! 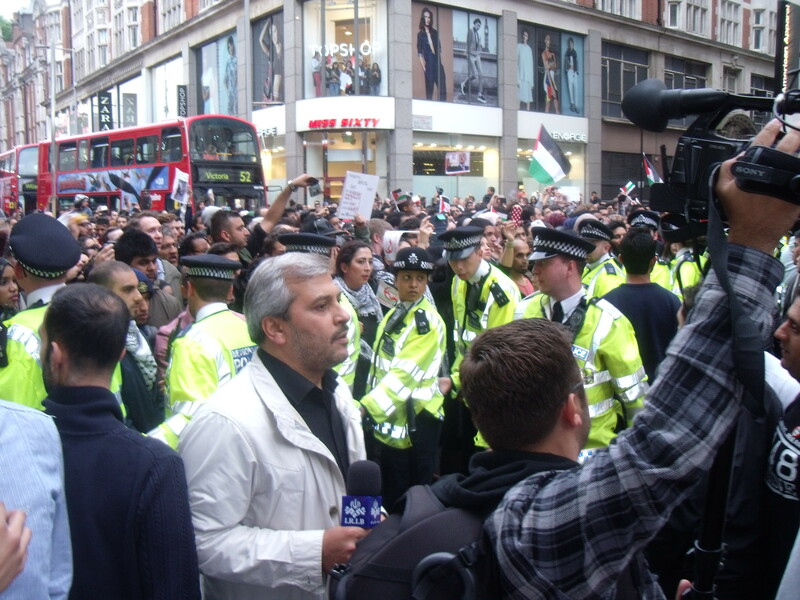 After I reported on Thursday that during Wednesday’s parliamentary debate on Gaza Labour MP Yasmin Qureshi had compared the situation of the Palestinians in Gaza to that of Jews living in Nazi Germany Labour Party activist Ofer immediately reported her remarks to Labour’s HQ and brought it to the attention of the media generally. You cannot get more offensive to the few remaining Holocaust survivors and to those who lost loved ones in Auschwitz, Belsen etc. 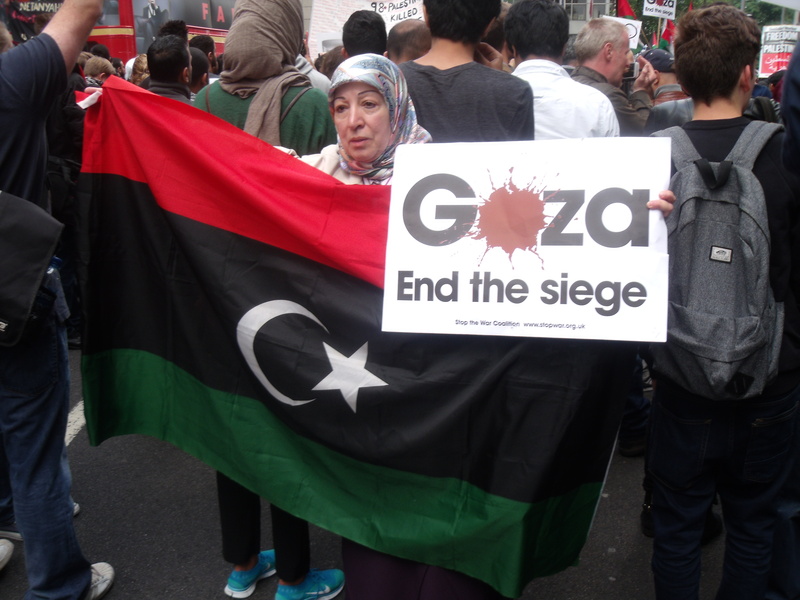 Gaza is no Belsen. And the suffering in Gaza is at the behest of Islamist-terror organisation Hamas which is happy to oppress its own people so that useful idiots in the West will blame Israel. So Qureshi is “personally hurt”? Poor her. Not as “personally hurt” as those who were in Auschwitz or Belsen etc or lost family there. But let’s all feel sorry for Qureshi instead! How can there have been “no intention”? Her words are 100% clear. There is no nuance! “I want to praise the people in Israel and the Jewish people in this country who campaign actively for the rights of Palestinians. Like my right hon. 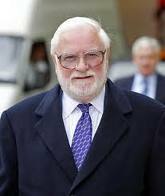 Friend the Member for Manchester, Gorton, I am sure that they are criticised by other Jewish people perhaps for trying to betray the state of Israel”. 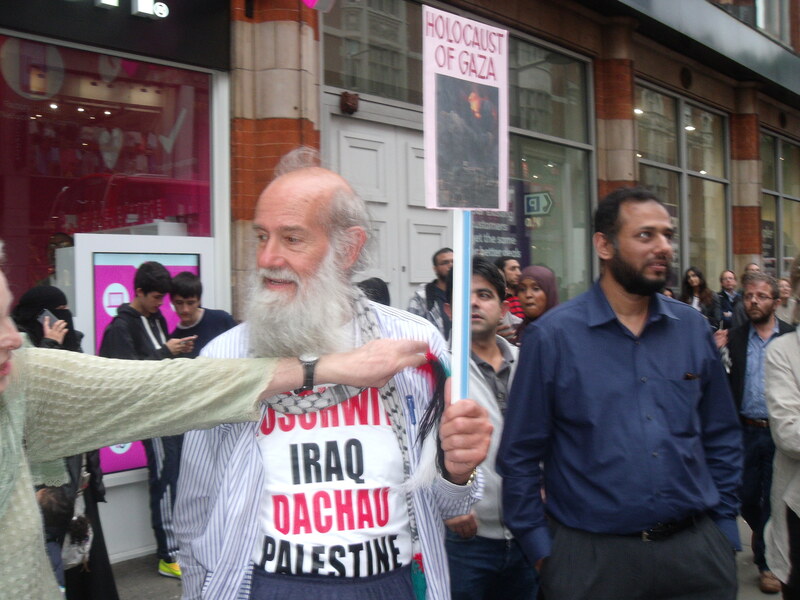 But the likes of Kaufman are criticised not just by “Jewish people” but people of all religions and none. 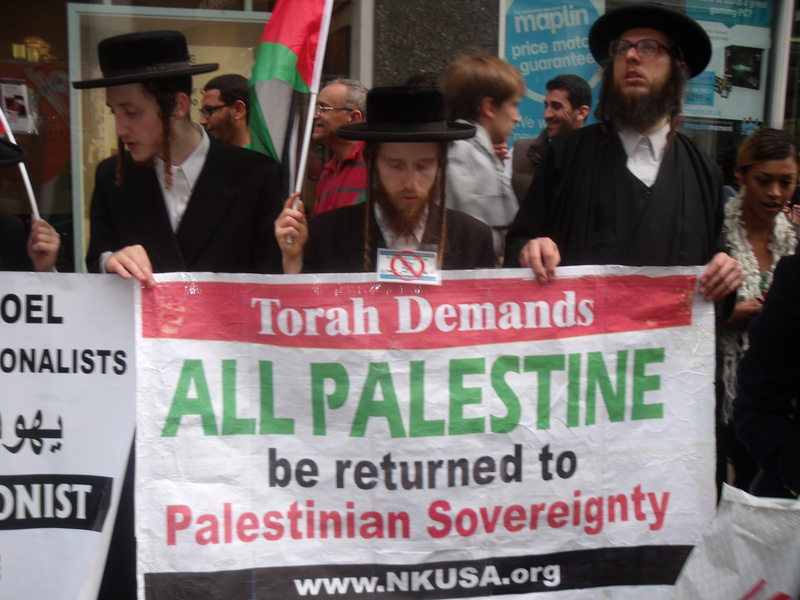 It is this division of Jews into “good Jew/bad Jew” that is almost tantamount to inciting racial hatred. Meanwhile, these Holocaust comparisons are slowly, slowly becoming the norm. 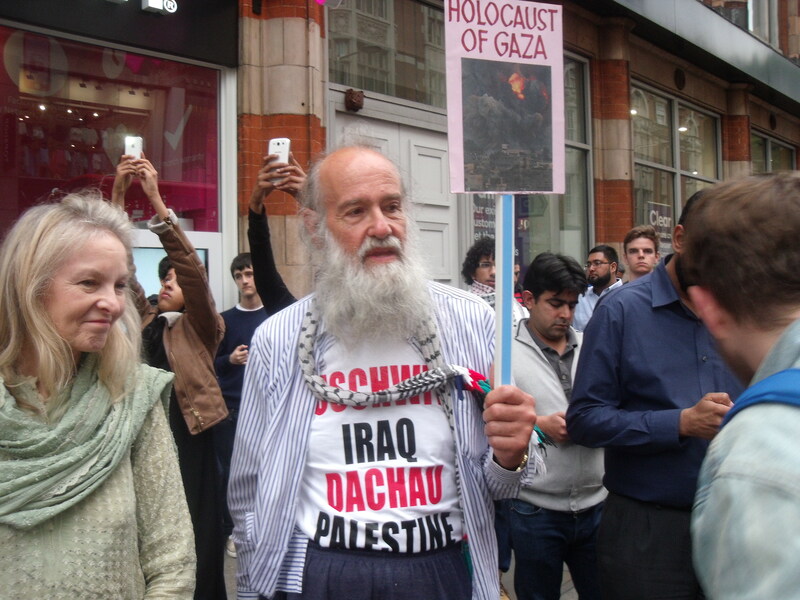 American Professor Joel Beinin told a student audience at SOAS recently that Israel is putting the Bedouin into “concentration camps” and at a recent War On Want talk at SOAS students were told that the Palestinians are living in “apartheid ghettos”. Thanks to the rhetoric of Beinin, Qureshi, War On Want and others Israeli Jews (and, by extension, any Jew that supports Israel) are slowly becoming thought of as Nazis. 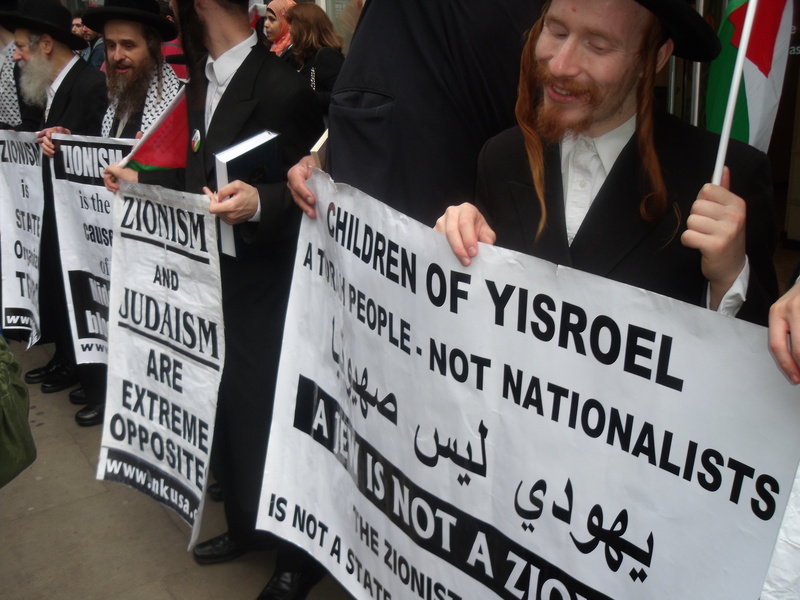 Another two fingers go up to British Jews. Today’s Sunday Times cartoon doesn’t work on any level, but you can see how it came about. Over the last month certain British commentators have been writhing around in pure ecstasy at the prospect of the Israeli electorate moving to the right. Some of the commentary has made me wince with even Jewish commentators hinting that Israel has shifted to the far right; the connotation being that Israel has finally become a fully fledged fascist state, the antithesis of what would have been expected after the horrors of Nazi Germany. But, sadly for them, Israel actually shifted to the left in the recent general election. All those columns that certain journalists wanted to write about “the fascist State of Israel” will never see the light of day now. The time they spent concocting the most vile aspersions to cast on Israel has been wasted. Guardian and Independent newspaper columnists have had to, on the whole, hold their fire since the election. Labour politicians like Richard Burden MP have been forced to hold off tweeting the most nastiest denunciations of Israel. But for some reason The Sunday Times, of all papers, couldn’t hold off publishing Gerald Scarfe’s vile slur of a blood libel with its depiction of Israel’s Prime Minister Benjamin Netanyahu as a callous murderer of innocents, including Palestinian children. And by juxtaposing the Holocaust with the West Bank and Gaza Ward is actually mocking what happened to the Jews in the death camps, whatever sympathy for them he tries to evince in his statement. The West Bank and Gaza are no Auschwitz, Mr Ward, even though many a Jew hater has tried to equate them. “Israel is worse than Hitler” and “Is Hitler the new Moses?” These are your supporters, Mr Ward. Well, yes, Mash’al, it does hurt, but it hurts mainly because I always thought the UK was a comfortable place for Jewish people to live. I still do, but that nonsensical Sunday Times cartoon has rocked that certainty ever so slightly. But I am also grateful that although I deeply feel Jewish I, however, feel no religious obligation to dress as a more religious Jew and, therefore, exposing myself to the horrors of what the Sunday Times cartoon might compel a person with a violent bent towards Israel and/or Jewish people to carry out. Another Toulouse comes to mind. And, I’m sorry, Mash’al, but it wasn’t me who targeted the Prophet Muhammad. And nor would I. And for that matter it wasn’t Jewish people either, although Mash’al’s comment goes to show how the initial rumour that the maker of that horrendous film depicting Muhammad in such an unseemly manner was Jewish has now achieved permanence. After the last week one can see why the Jewish people have traditionally moved around so much, forever trying to evade the animus that certain parts of society have always held for us. 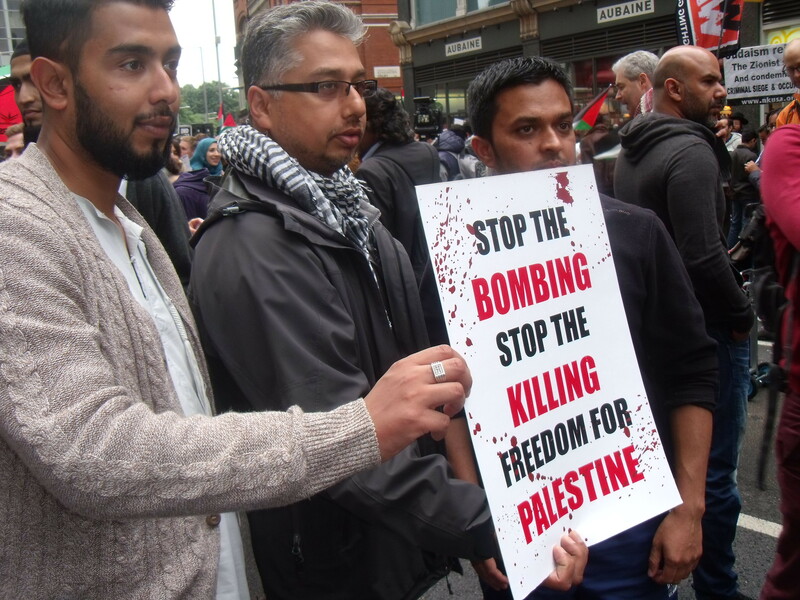 Labour’s Shadow Justice Minister praises Hamas “concessions” at PSC event. 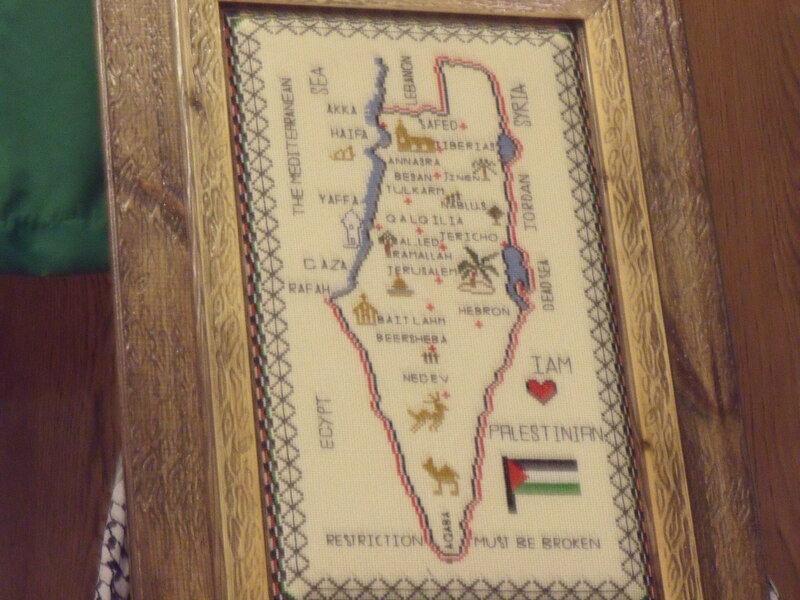 This map, without Israel, took pride of place behind all the speakers. 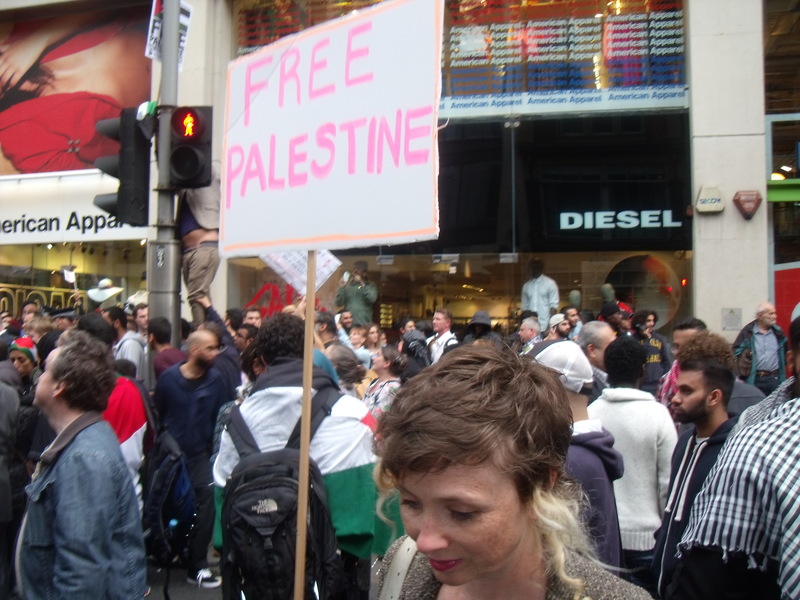 Last night the Palestine Solidarity Campaign revealed the horrors of what life would be like for British Jews under Labour. 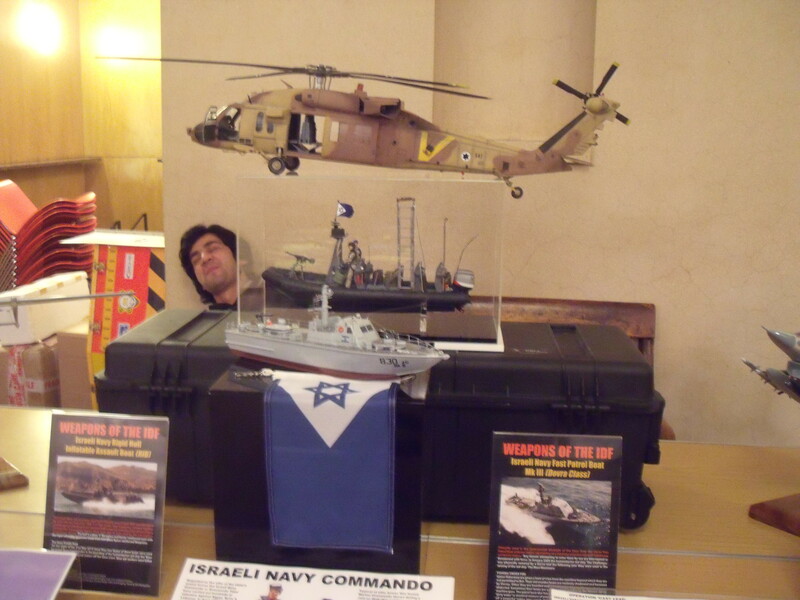 The Jew killing Hamas machine would become regulars to Downing Street. But, first, a love letter. Maybe Ms Outram hasn’t visited Auschwitz and seen the gas chambers and the ovens or the pictures of naked Jewish women huddling together in front of a pit before being shot. Maybe she doesn’t know that one million Jewish children died in The Holocaust. This is the true Holocaust industry, a term coined by Norman Finklestein, where the likes of Ms Outram get paid for minimalising the horrors of Auschwitz by comparing it to Gaza. But Outram set the theme for the evening. Meanwhile, Labour MPs Jeremy Corbyn and Andy Slaughter, the Shadow Justice Minister, sat on stage applauding and when it came to speak everyone stood in front of map of Palestine, where there was no Israel. This from a potential Justice Minister. Except recognition of a Palestinian state is not recognition of Israel. A small swing from the Conservatives to Labour in 2015 and the Liberal Democrats could ditch the Tories. A Lib/Lab coalition would be the perfect storm for Israel and British Jews with Hamas becoming regular visitors to Number 10. Slaughter has already met Hamas and the Labour Party offered no comment. Corbyn (clip 6) finished off the evening calling for some potentially five million Palestinians to be allowed into Israel, effectively turning it into yet another Arab state while taking the benefits of the Israelis’ hard work builing up a successful country. Michael Deas (clip 7), Palestinian BDS National Committee, attempted to paint Israel as being undemocratic, but he was soon followed by Kika Markham (clip 8), the widow of Corin Redgrave, who read an extract from a role she performed as Haaretz journalist Amira Hass in which Hass talks of Israel in the most despicable terms. A country that allows Hass and Haaretz to attack it so regularly cannot be anything but democratic. There isn’t something even near the equivalent of Haaretz for the Palestinians and that speaks volumes. This was on the wall at the PSC’s Conway Hall event. 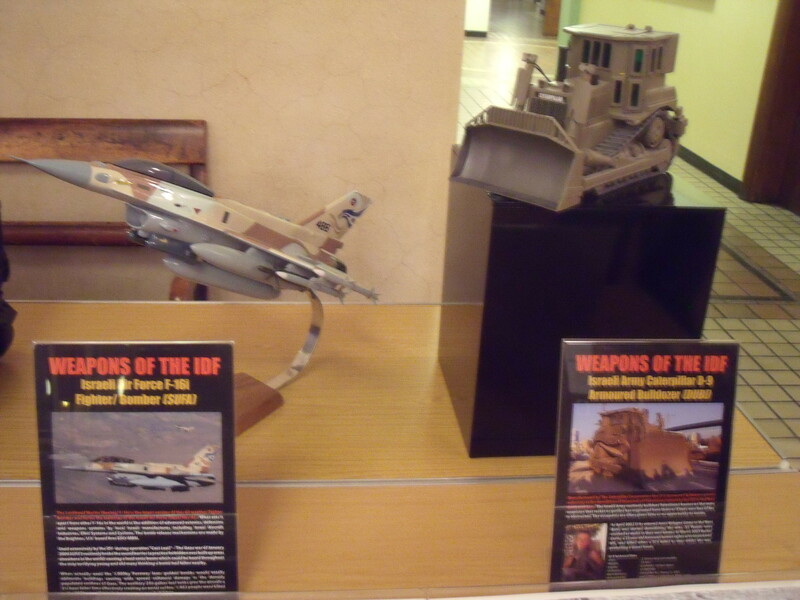 Toy models displayed in lobby at Conway Hall. 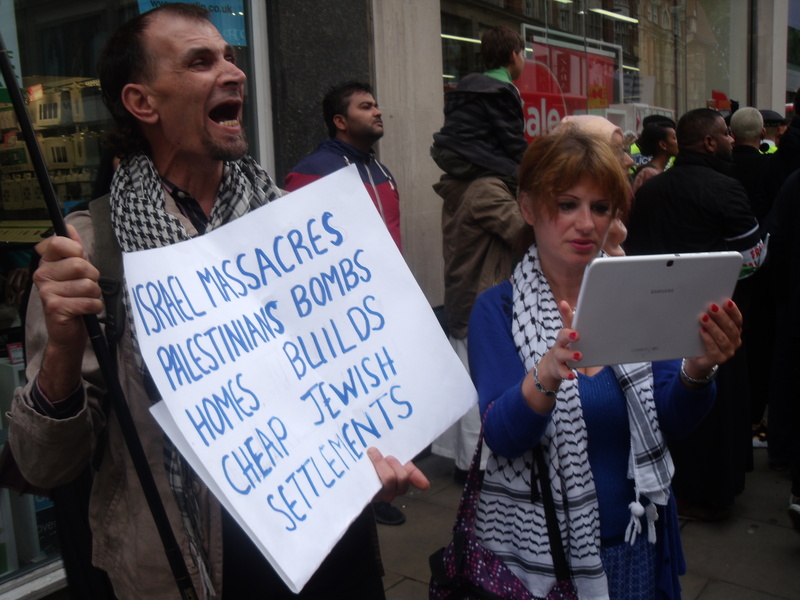 Jon McKenna, Tracy-Ann Wood, Leigh Outram, Laura Freeman watching Clare Quinn spew poison about the Jewish state. Imagine the outcry if an organisation staged a play called Seven Muslim Children. 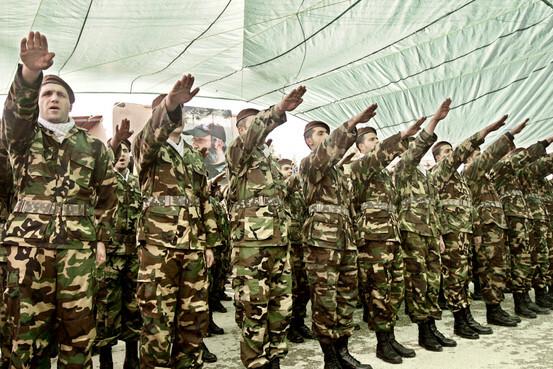 The play might start off with Srebrenica where 8,000 innocent Muslim men and boys were murdered by the Serbs. It might then portray how Muslims have become so hardened by the massacre that they don’t care who they kill or cause to suffer. It might then show how Muslims dehumanise their enemies to justify the murder of innocent children, while all the time taking solace for this from the Koran. There would be an outcry in the media and political circles and justified cries of Islamophobia. Jewish organisations would protest against such a play. So why is there no outcry over the continued staging of Carly Churchill’s Seven Jewish Children which portrays Jews gradually being transformed from the innocent killed into the killers of the innocent. 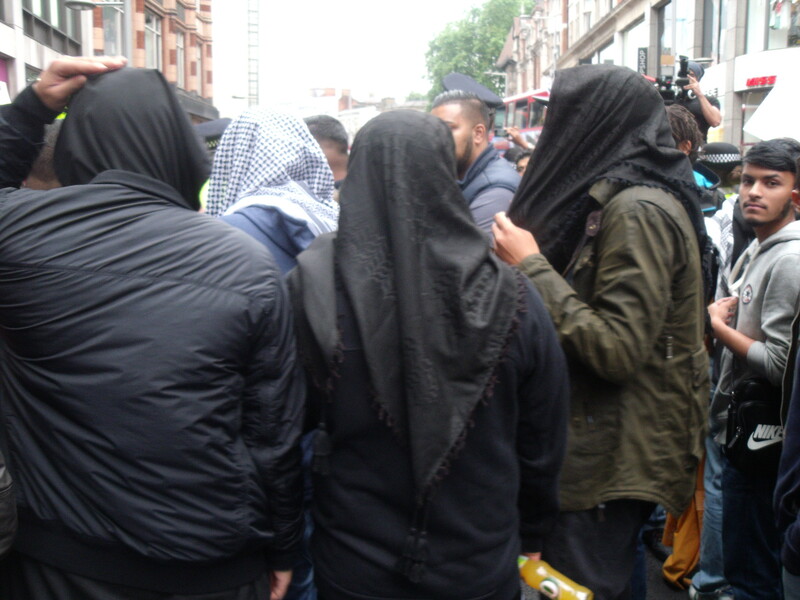 Why are mainstream Muslim organisations silent? I saw this play when it was originally performed at the Royal Court theatre. The theatre was full. It was quite unnerving sitting there as a lone Jew watching the audience heartily applaud. The play packs virtually every single anti-Jewish trope going into its nine minutes. It felt like a throwback to past times when Jews were a powerless minority continuously taunted by a non-Jewish majority. 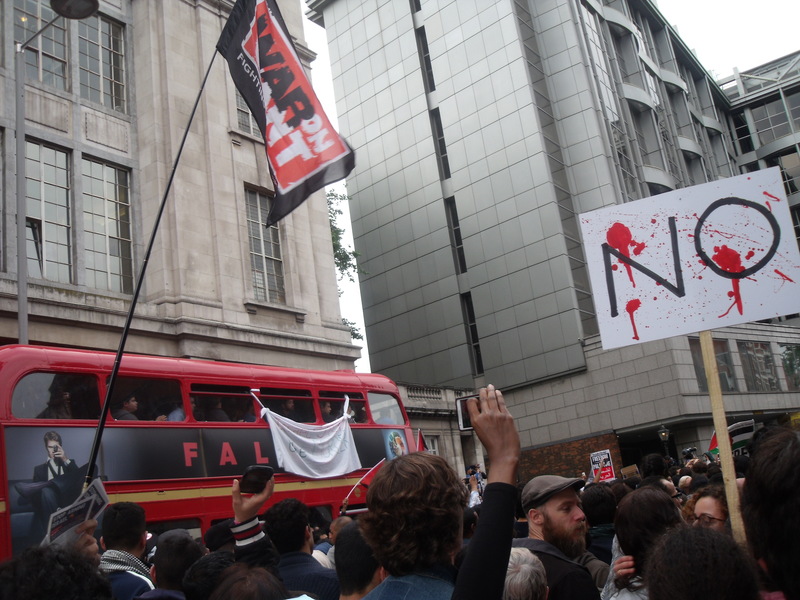 But this was London, 2009. 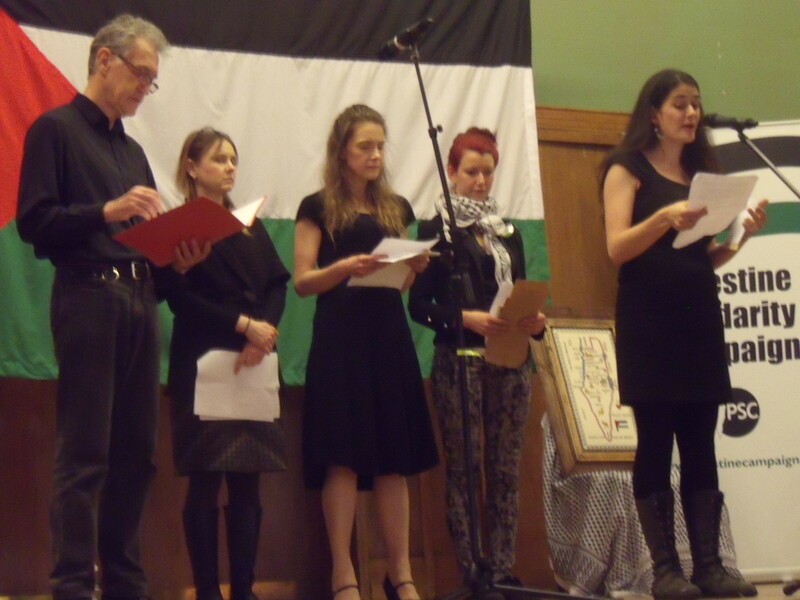 Now not only is the Palestine Solidarity Campaign staging it on December 7th as part of its Winter Concert, it is doing so at the Polish Centre in Hammersmith, London. It adds insult to injury to hold an anti-Jewish play that invokes the Holocaust at a Polish centre when 3,000,000 of the 6,000,000 million Jews who perished during the Holocaust died in Poland. Tell her we’ll be here all the time. Tell her more when she’s older. Don’t tell her there’s any question of danger. Tell her her grandmother would be proud of her. No but don’t tell her Arabs used to sleep in her bedroom. Don’t tell her she can have them in the house. Tell her again this is our promised land. Don’t tell her I wouldn’t have come if I’d known. Tell her maybe we can share. Tell her we’ve got new land. Don’t tell her anything about water. Don’t tell her anything about bulldozers. Tell her we’re building new towns in the wilderness. Tell her they want to drive us into the sea. Tell her we’re going swimming. Tell her she can stay up late and watch Friends. Don’t tell her her cousin refused to serve in the army. Tell her, tell her about the army, tell her to be proud of the army. blood and what do I feel? tell her all I feel is happy it’s not her. Tell her we love her. 2009, when the play was written.